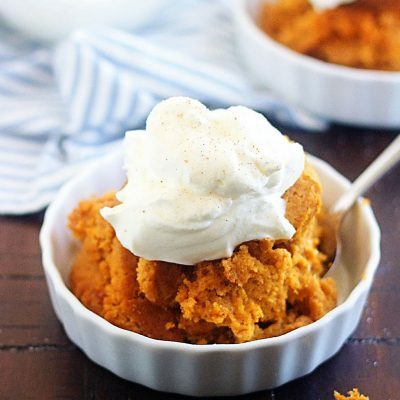 In a large bowl, combine pumpkin, evaporated milk, sugar, Bisquick, eggs, melted butter, pumpkin pie spice, cinnamon and vanilla. Mix until well combined and then pour into a 3 or 4 quart greased slow cooker. Cover with lid. Cook on low heat 4 to 6 hours or until set. Serve with a scoop of sweetened whipped cream or vanilla ice cream, then sprinkle with cinnamon and sugar on top, if desired. All slow cookers cook differently, so keep an eye on this as it cooks because you don’t want to overcook it. I check it at the 4 hour mark and then if it’s not set, check it every 30 minutes after that. Don’t try and make this in a 6 quart slow cooker unless you double the recipe.